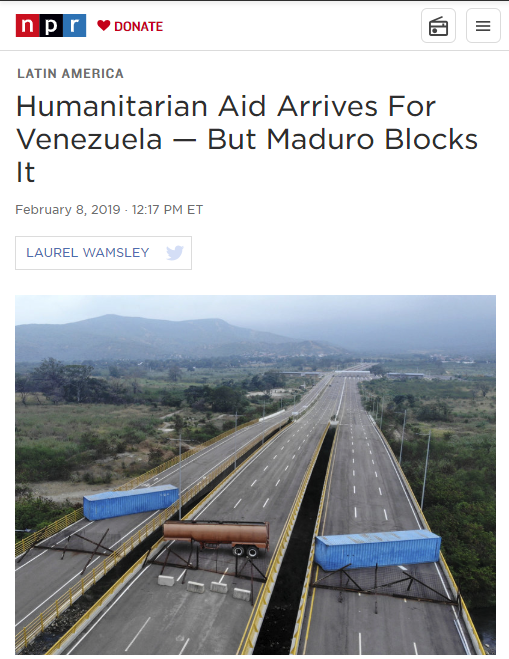 All of the above articles—and scores more like it—repeated the same script: Maduro was blocking aid from the US “out of refusal to relinquish power,” preferring to starve “his own people” rather than feed them. It’s a simple case of good and evil—of a tyrannical, paranoid dictator not letting in aid to feed a starving population. Except three pieces of key context are missing. Context that, when presented to a neutral observer, would severely undermine the cartoonish narrative being advanced by US media. Both the Red Cross and UN warned the US not to engage in this aid PR stunt. The bridge in question is a visual metaphor contrived by the Trump administration of little practical relevance. The person in charge of US operations in Venezuela has a history of using aid as a cover to deliver weapons to right-wing mercenaries. The International Committee of the Red Cross has warned the United States about the risks of delivering humanitarian aid to Venezuela without the approval of security forces loyal to President Nicolas Maduro. UNITED NATIONS — The United Nations warned on Wednesday against using aid as a pawn in Venezuela after the United States sent food and medicine to the country’s border and accused President Nicolas Maduro of blocking its delivery with trucks and shipping containers. Indeed, as Bevins also noted, the Red Cross has long been working with local authorities inside Venezuela to deliver relief, and just last week doubled its budget to do so. We have ample evidence the Maduro government is more than willing to work with international aid when it’s offered in good faith, not when it’s a thinly veiled mechanism to spur civil war and contrive PR victories for those seeking to overthrow the government. 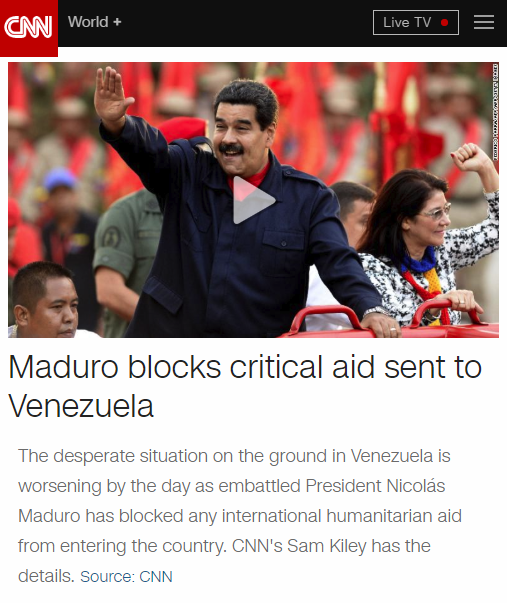 It’s not just Maduro—as the Western media are presenting it—who opposes the US aid convoy; it’s the UN and Red Cross. Why do none of the above reports note this rather key piece of information, instead giving the reader the impression it’s only the stance of a sadistic, power-hungry madman? (2) Despite dozens of media outlets giving the impression (and sometimes explicitly saying) that the Venezuelan government shut down an otherwise functioning pathway into the country, the bridge in question hasn’t been open for years. It’s true the Venezuelan government appears to have placed an oil tanker and cargo containers on the bridge to prevent incursion from the Colombian side, but the other barriers, as writer and software developer Jason Emery noted, have been in place since at least 2016. According to La Opinion (2/5/16), after its initial construction in 2015, the bridge has never been open to traffic. How can Maduro, as the BBC suggested, “reopen” a bridge that was never open? The reality is BBC and other Western media were just going along with the narrative pushed by Sen. Marco Rubio and Trump Secretary of State Mike Pompeo, not bothering to check if their primary visual narrative was based on a bad faith, context-free PR stunt. This point is a relatively superficial one, but in a long term PR battle to win over Western liberals for further military escalation, the superficial matters a lot. Rubio and the Trump administration cooked up a gimmicky visual metaphor, and almost every outlet uncritically passed it along, often making factually inaccurate assumptions along the way—assumptions the Trump State Department and CIA coordinating the effort knew very well they would make. (3) The Venezuelan government has an entirely rational reason to suspect the US would use humanitarian aid as a cover to smuggle in weapons to foment armed conflict: The person running quarterback for Trump on the current Venezuela operation, Elliot Abrams, literally did just that 30 years ago. Mr. Abrams spoke at a news conference Saturday in response to statements by Robert Duemling, former head of the State Department’s Nicaraguan humanitarian assistance office, who said he had twice ordered planes to shuttle weapons for the Contras on aid planes at Mr. Abrams’ direction in early 1986. It’s literally the same person. It’s not that Maduro is vaguely paranoid the US, in general, would dust off its 1980s’ Contra-backing Cold War playbook, or some unspecified assumption about a higher-up or two at State. It’s literally the exact same person in charge of the operation who we know—with 100 percent certainty, because he admitted to it—has a history of using aid convoys as a cover to smuggle in arms to right-wing militias. It’s all playing out right now, in real time. The same actors, the same tricks, the same patently disingenuous concern for the starving poor. And the US media is stripping it of all this essential context, presenting these radical regime-change operators as bleeding heart humanitarians. The same US media outlets that have expressly fundraised and run ad campaigns on their image as anti-Trump truth-tellers have mysteriously taken at face value everything the Trump White House and its neoconservative allies have said in their campaign to overthrow the government of Venezuela. The self-aggrandizing “factchecking” brigade that emerged to confront the Trump administration is suddenly nonexistent as it rolls out a transparent, cynical PR strategy to delegitimize a Latin American government it’s trying to overthrow. ← Grist: Green New Deal Failing to Keep Green Promises?